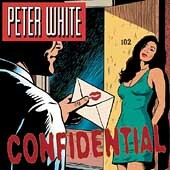 Peter White’s Confidential is an album I have had in my collection for some time, and in fact I purchased it second hand. Before buying this album I had heard quite a bit of his music, but somehow this album is kind of special. I love music that tells stories, even if they are not true, and the best stories are the ones not just told in in song, but in a subtle way accross an entire album. I cite Alexander O’Neal’s “Hearsay” as a prime example (although a far cry from jazz and Peter White!). This album however is special, because it actualy contains a story in the inlay card, and the songs on the album relate to different parts through their titles (and if you are one to read things into music without words like me, the songs themselves relate to it too). There are two songs on the album that have vocals, my favorite of the two, “She’s in love” is sung by Christopher Cross, an old favorite of mine; his musical talent most noted in his song sailing – on that still makes me feel amazing when listening to it to this day. The other vocal track “Lost without your love” is by a less known, but none the less brilliant artist David Sparkman. The album is almost all smooth jazz, which given the story in the album is very appropriate. One notable exception on the album is the track “Jump on it” aired in fact on URY during my time there. It has a funky edge to it, and really makes you sit up compared with the rest of the album. Peter White has a very special way of playing guitar, one that stands out, but none the less has subtle differences on every track, tempo and backing complementing it perfectly. It is also worth noting here that time spent does seem to relate to quality in this instance; the album took over a year to put together, and a lot of hard work not only from Peter, but from his entire team made it something really great. If you like smoother music, or even if you are simply a fan of great guitar, this album is really worth a look. If you haven’t heard music from Peter White before, you are in for a treat. I do like the love aspect in many tracks, and will confess to owning a large number of love songs. Love in jazz however is something entirely different; most of the time you are not left with words to tell the story for you, so for you to like it it’s got to mean something to you. This album does exactly that for me. If you own this album, please leave your own views in the comments as it would be good to know what others think about what is, I’m sure, my favorite Peter White album (I now own several! ).